I’m not very keen on heights. Actually, that’s not quite true. I’m fine with heights. Whenever there’s an opportunity to go up something and see the view from the top, I’m usually right there. And like my brother, Bisckits, there’s nothing I love more than flying. (As long as it isn’t on the back of a vulture, as happened to me in Jaspa’s Journey: The Great Migration.) No, it’s edges I don’t like. That feeling of being on the brink, with nothing to stop me tumbling over (even if there is). In fact, I often feel uncomfortable just watching someone else standing too close to a drop in a TV show or movie. 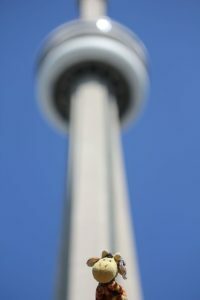 For those of you who don’t know, until 2010 the CN Tower in Toronto, Canada, was the world’s tallest free-standing structure. The tip of the mast is a staggering 1815.4 feet from the ground, while the highest observation point, the Sky Pod, is still a knee-wobbling 1465 feet above the Earth. Yet until 2011, it was the glass floor on the lowest level of the main observation pod – a mere 1122 feet up – that had people’s hair standing on end. It’s fun to watch nervous tourists trying to pluck up enough courage to step out onto the glass (although I was once one of them). Logically, you know it’s safe. But as you stare between your feet at sidewalks almost a quarter of a mile below, part of your brain screams this isn’t normal! 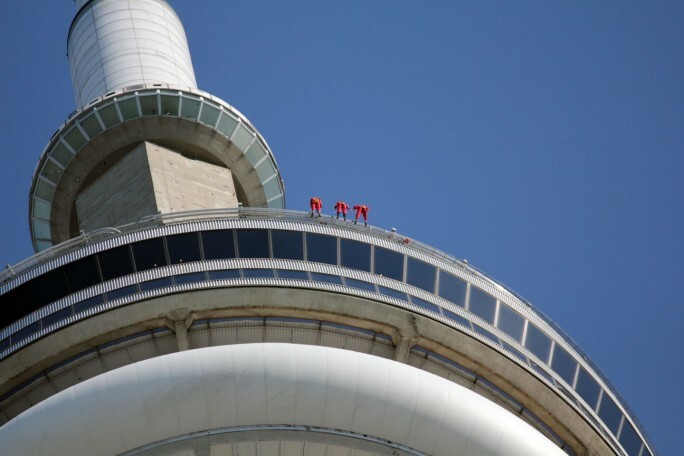 Then, in 2011, the CN Tower opened the EdgeWalk. And suddenly the glass floor seemed like no big thing. The EdgeWalk is part of the main observation pod, and is only (only!) 1168 feet above the ground. It doesn’t have a glass floor, and is nearly 300 feet closer to the ground than the Sky Pod. So what’s the big deal? 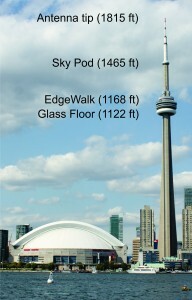 Well, the big deal is that the Sky Pod and the glass floor both have something the EdgeWalk doesn’t… Walls! 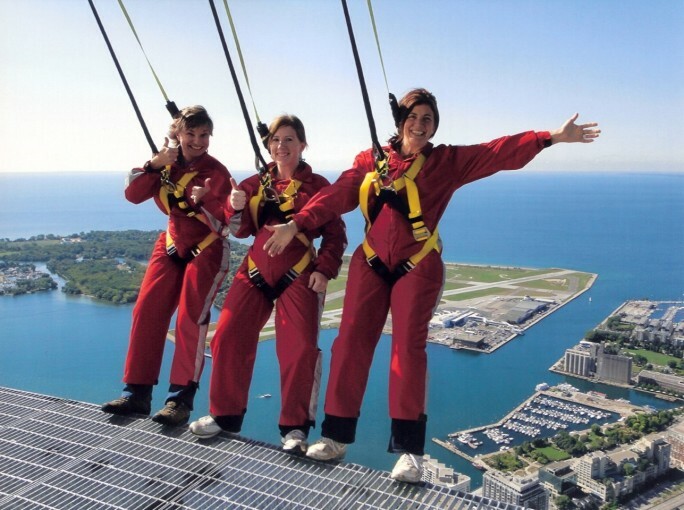 Anyway, in September of the year the EdgeWalk opened, our friend Shiloh decided she wanted to do it for her birthday. And Sue, being ‘mentally hilarious’, jumped at the chance to join her. I have to confess that, at the time, I tweeted that I wished I was accompanying them. But the truth is that, even if they did make a special harness small enough for me, there’s no way you’d find me out there. To my lasting shame, like the cake in Portal, the tweet was a lie! Naturally, Sue and Shiloh came back down still buzzing with adrenalin. They’d both thought the EdgeWalk was incredible and couldn’t wait to do it again. But although I’ve been up the CN Tower at least a dozen times, both before and since, on that particular occasion I was glad to remain firmly on the ground! My name is Jaspa, and I’m the main character in the Jaspa’s Journey adventure novels by Rich Meyrick. To learn more visit my website, www.jaspasjourney.com, and blog, Jaspa’s Journal, or follow me on Facebook and Twitter. Top 5 Extreme Adventures – #4 Sky Jumping from the Stratosphere Las Vegas Hotel & Casino!